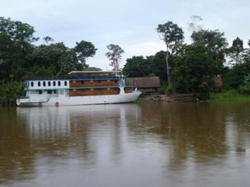 Educational tours to Peru for Amazon River boat cruises and lodges. Peru tours and travel options. We arrange tours to Peru the year-round for individuals, couples, families, schools, organizations, and corporate events. Note for independent travelers: Most of our Peru tours are custom with private service. 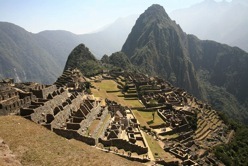 explores the Sacred Valley of the Inca, Cuzco, and includes overnight at magnificent Machu Picchu. The 8-day, cultural adventure offers a great introduction to the colorful Andean peoples, their archaeology, history, environment, cuisine, and handicrafts. You also visit remote Andean villages and archaeological sites such as Pisaq, Ollantaytambo, Sacsayhuaman, and more. with overnights in remote and 4 different exotic lodges! With expert guides, you travel over 300 miles on the Amazon River and its tributaries. Includes stay at Ceiba Tops Resort and the ACTS field station where you will experience the world’s longest Treetop Canopy Walkway! The premier rainforest lodges provide a relaxing base for excellent birding and wildlife viewing. another great way to explore Amazonia! Three natural history itineraries explore the Amazon River from Iquitos, Peru. Your live-aboard riverboat has air-conditioned cabins with private baths. The varied daily excursions and naturalist guides provide an insightful look at life along the world’s largest river as you travel through the world’s largest rainforest. Our Amazon River Cruises on small river boats travel both up and down the Amazon River from Iquitos. We have packages and custom design travel for other great destinations in Peru such as Tambopata, Manu, Iquitos, Lake Titikaka, Nazca Lines, Nasca, Paracas, and the Ballestas Islands. Plus, we customize stays and itineraries in Lima, Trujillo, Chiclayo, Arequipa, Colca Canyon, and more. A Cultural and Culinary Exploration in Peru. This week long food festival is held in September. While learning about the cultures of Peru, their environment, history, art and foods. You will experience why National Geographic named Peru the "next Foodie Frontier" in their Best of the World for 2012. Below are some of our more popular trip extensions that may be combined with our Andean Inca Exploration to Cuzco and Machu Picchu and/or our Amazon River tours. Academic field-school programs and Volunteer opportunities for local community service projects can also be arranged. CEIBA TOPS AMAZON LODGE & CANOPY WALKWAY RAINFOREST, tour from Iquitos. 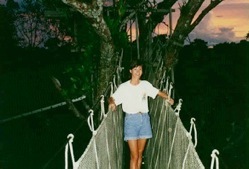 MANU CLOUDFOREST AND AMAZON RAINFOREST, tour from Cuzco. Educational travel to Peru, since 1992.